One of my favourite times of the year growing up was late May/early June. It heralded the imminent arrival of summer and all the promise that that held. It also meant for us farm children that this was silage time. Silage time meant that our normally quiet farm became a hive of activity. My dad was, amongst other things ( publican, shopkeeper, jockey and trainer), a silage contractor so this time of year meant that it was all hands on deck to help out, seasonal workers joined my dad and uncle, and mum got roped into to help out. My older sister and I were always delighted to be given the roles of chief tea makers and were put in charge of making supper for the hungry silage men. Although I’m sure there must have been some variety, my prevailing memory of these suppers was an Irish salad. For the uninitiated an Irish salad consisted of several slices of ham, often rolled for a fancy effect, some hard boiled eggs, tomatoes, potato salad made from the leftovers of dinner and in an effort to qualify it as a salad there was usually one leaf of iceberg lettuce with a spoon of coleslaw on it if you were lucky. In a world of unlimited salad option this may all sound very basic but to a nine year old girl who was allowed to assemble it, this was the height of sophistication. A lot of the excitement lay in the upheaval of routine, dinners were wrapped and brought out to the fields to feed men who were too busy to come in for it, the odd bottle of cider or beer was consumed by these self same men. For us children this resulted in some benign neglect that I’m sure we took full advantage of. I’m conscious that time and nostalgia have washed my memories clean, have polished them to where only the good remains. I know there was stress, that my then smoking dad relied on 60 Major a day to get him through! As he has never been known to for his ability to hold his temper in a crisis there was often shouting and cursing and inevitably someone was sent ‘back to Geary’s’ to get a part for the mower. In rural Ireland where you go varies, not by geography but by some indisputable navigation that is handed from one generation to the next, for instance, you go up to Cork (south of us) in to Limerick ( north of us) over to Doneralie ( east of us) and back to Newmarket ( west of us)…clearly SatNav is a poor substitute for these directions! My already busy mother was called on to do everything from milking the cows, to making food for an ever changing number of men at ever changing times of the day. She would help cover the silage and somehow keep the show on the road with us whilst all this went on. 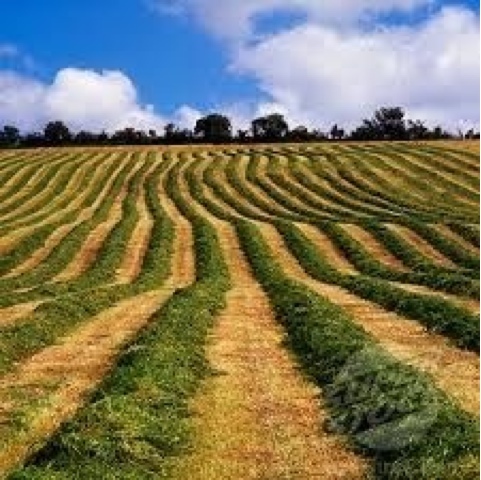 And yet it is with huge fondness I remember this time, there was always a feeling of community, of neighbours helping neighbours, the smell of freshly cut silage will always bring a smile to my face. I pass field upon field of silage on my way to work this morning, neat green rows of grass basking in the sunshine, or bare fields which look freshly shaven, an almost lime green in contrast to the deeper greens surrounding them. I’m nostalgic and yet I know it’s all so different now. My parents get contractors in now, huge machines that can do in a day what once would have taken a week. Contractors now routinely work around the clock and last year our silage was completed at night, while the rest of the world slept. I’m sure it’s more efficient, and with the short windows of good weather that we get it probably relieves a lot of stress, but somewhere along the way a lovely tradition has been lost. I’m sure for many farm children a day in school might mean that they miss the whole thing. Faster times, more efficient times, not necessarily better times though. Fancy tomatoes…I remember them well, I'd say the silage lads thought we were mad! !